Under the critique, however, there remains a bittersweet note to intrinsic human isolation and the loneliness that drives us towards something, anything, to make sense of life and our place in it. Biddle’s characters are basically isolated; even when together, they fail to communicate on a fundamental level, and remain strangers to each other, desperate for contact. Into this scrabbling vacuum between need and realisation, what Blaise Pascal called a ‘god-shaped hole’ (and what psychologists would call the intrinsic need to belong; a remainder of the schisming trauma of the child realising its separateness from its mother, and the dawn of its desire to please and thereby remain with its parents), comes the promise to some of religion’s ‘community’, for others it is the worldly decisions presented to fill the void, and for both: the consequences. The most aware character of the whole thing, at least from the perspective of soul-searching and self-flagellatory revelation is low-life Hank, who is only too aware of what he should be saying, should be doing, yet lacks the moral strength to carry it through. Hank is not an obvious prophet; a (mostly) functioning alcoholic, running away from his own religious past, away from responsibility for his life and his relationships (okay, so some reference to Jonah can be made), he relates most closely to his dog, and even then by guiltily realising what he should be doing to care for it properly. Hank’s affection, when won, might be honest, but it is rough and feeble compared to the strength of convictions in those around him. And yet he survives, to witness another day. It is mostly through Hank’s eyes that we see the world, and from his perspective of seeing but not acting, feeling swept up in others’ crusades, Hank embodies a certain type of modern nihilism; feeling powerless against bigger forces. However, Hank does not do himself favours; as a temp worker, with a serious substance problem and questionable personal grooming, he resembles nothing so much as a bum; the clarity of wisdom, perhaps, of the tramp, being as he is the social outsider and able to look in with a certain objectivity on those within? Certainly his self-castigating inner life is considerably more ‘aware’ than his buddy Max. Biddle has fun presenting a chalk-and-cheese shape-up between these two. Hank the bum, Max the higher flyer with a suit, an office job and seeking ‘enlightenment’ through a Westernised version of pseudo-Buddhism. Hank may not have all of his childhood faith any more, but his ambivalence about having anything to really believe in is far more humble than Max’s selfish quest for me-fulfilment—a common trope in Western spiritualism Biddle is having a great big poke at with a sharp stick. The fairy cult, too, is a writerly line of attack; on the danger of cults (fringe in this case, but the Christian religion of other characters suggests a mainstream cultishness) and on the ridiculous desperateness of modern ‘self realisation’. The founder of the group, from which a suicidal splinter has detached itself, claims it was meant to be an organisation all about self-improvement and self-determination; the latter of which, of course, would defeat the purpose of organised faith groups, since if one becomes truly self-determined, by pure definition, one does not need a secondary source of comfort and support. In this way, Biddle exposes the ridiculousness of such self-absorbing ‘spiritualist’ claims. More obvious criticisms of organised religious faith appear in the figures of Lizzie and Luna’s father. Both Southern Baptists, when the children go missing, instead of listening to the non-Baptists (Candy and Hank) who have a good idea where they have gone, or even setting out to make a search, they choose instead to pray for the children’s return. Luna’s father is a big bear of a man; grizzled, beer-bellied and closed-minded. Lizzie is a little more worldly, having had a child out of wedlock and moved away from her smothering family; although she continues to have visits from her disapproving mother and sister—as a form of penance, one feels. She even strikes up a relationship with Hank, of all people. Yet she disapproves of Kevin learning about Evolution, which results in him being sent down a year to near pre-school level (a swipe at the ‘uneducated’ and almost infantile prejudices of blind faith?). These people are basically bottom-feeders, or live close by them. Lizzie has taken several steps down and away from her religious, lower-middle-class community into the rougher side of town. Max may live in a decent block, but he hangs out with Hank and sees Candy at the strip bar. Heather decides to become homeless following the threat of removal of her ‘adopted’ ‘son’; a monkey from the zoo. Living out of her car, looking like a bag lady, desperate to save her surrogate ‘child’ and cult brain-washed, she comes to the minds eye as a well-known ‘mad old woman’ type; muttering to herself on some street corner. Candy sells drugs for her brother and performs at the strip bar. And Hank—well, Hank is a bum. All of them, however, are fixed on their view of life and how it serves them and gets them through it; with religion, substances and gratification. Only Hank’s mind is malleable enough to see more than his view, even if the choice to take that path may mystify him. Candy’s heroic attempts to save the children are part of her own, self-destructive, martyr’s trajectory. She is making a penance of her own; to her own self-loathing for failing to be anything but her brother’s puppet. Candy may not pray to any deity, but she is still placing her life on an altar as a sacrifice to appease the demons she feels nipping at her heels. We feel far more empathy for her and Hank; traditional low-lifes and considerably more likeable than the pretentious Max, the guilt-racked Lizzie or pathetic Heather. Biddle moves from character to character with a deft and certain touch, imbuing each with their own life, yet winding them around each other in a clever, tightly plotted tapestry. It is interesting that these events serve to show the humanity, and in their roles, the spiritual strength and superiority of apparently ‘wasted’ low-level individuals; the atheist of the title would do well to pray for the strength of the human, and our capacity for good as well as cruelty—itself, as the book suggests, a result of personal selfishness rather more than planned action. In Candy and Hank we have our ‘religious’ icons and hero types in this quest; Martyr and Prophet-Witness. The point would be for the Martyr to make an example and the Prophet to come out of hiding in himself (like Jonah from his whale) and shout his message of faith. But by the end, even these traditions are turned on their head; Candy is not so very gone, and Hank, we feel, will quickly sink back into his sloppy life; his remarkable perspicuity lost in general apathy. So pray for us sinner; for we will f*ck up again and again. When it comes down to it, faith—in anything, spiritual or physical, human or divine—comes down to choice. To choose to follow one thing over another. Yet with every choice, there are consequences. The choice to sell magic mushrooms to flaky spiritualists means that Candy has to face the results of those sales once she realises they put children’s lives in danger. In the choice to remain behind, Hank has new layers of guilt to live by, but receives a glimpse of another life he could have chosen. The children, desperate to find something solid to believe in, choose what they think will provide the best route to happiness. Maturity comes in accepting those consequences; is this book a ‘prayer’ for the strength to do so? No one achieves anything like peace or fulfilment from their choices. Max uses his spiritualism to run away from responsibility. Candy, an ‘empowered’ woman; highly self-aware of her profession, comfortable in her body, tattooed and able to fight, makes choices that seem heroic, but are avatars of her distress over choices she has made to get her where she is; she is as much a victim of inevitability as Lizzie, with her strong religious ties and inability to break free of them completely. Biddle has turned an examination of life into a prayer; a test for the soul, with choices as the dragons to slay en route. And in her passion play, we have characters that are only remarkable as stations of the journey. Not one is raised up; not one made better or permanently elevated through cathartic suffering. Truly, if this story is about blind faith; the traps of faith, and the binds of faith—whether it has the label of a religion or of a servicing of the self—than we are all equally doomed. The promised Nirvana is impossible, the Rapture will not happen; the promises of faith are a lie, because we are human, and too flawed to be raised and remain raised. There is comfort in that; we are human, no more, no less, so marvel instead at what we can be, what we can do. Truly, in the land of failure of faith, the Atheist is free. Biddle is talented; very much so. 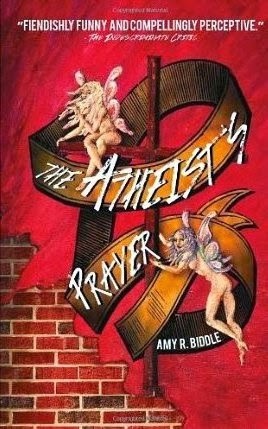 The writing in The Atheist’s Prayer springs along at a pace that amuses, titillates and captivates. Sparing extraneous detail, yet we receive a clear picture of her vision, and have much, much to chew over. Something of a minor triumph, Biddle is deserving of all the praise coming her way. Wow! I never expected such a thorough and truly encouraging review. Thank you a million times.